Strawberry is any of the various, low-growing perennial plants of the genus Fragaria in the rose family (Rosaceae), as well as the name for the edible, aggregate fruit of this plant, which is generally red when ripe, but can also be green, white, or yellowish in different species or varieties. There are more than 20 named species and many hybrids and cultivars. The most common strawberries grown commercially are cultivars of the garden strawberry, Fragaria × ananassa. 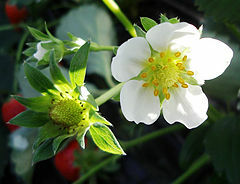 The strawberry flower and fruit of the strawberry are not only important for reproduction, but also provide larger values for the ecosystem and for human beings. Ecologically, the flower is a nectar source for bees, and the fruit is consumed by numerous animals. For humans, the fruit is popular not only for its pleasing taste, color, and texture, but also offers nutritional value. So desirable is the fruit that sixteenth-century author William Butler proclaimed "Doubtless God could have made a better berry, but doubtless God never did" (Herbst 2001). Today, human creativity is exhibited in the many varieties developed for commercial and personal gardening purposes. Fragaria is a genus of plant in the family Rosaceae. Rosaceae is one of the largest families of flowering plants with about 3,400 species, including apples, berries, peaches, plums, cherries, the hawthorn tree, the mountain ash, and many others. Strawberry flowers and developing fruit. Fragaria are low herbaceous perennial plants that have compound leaves with three hairy, sawtooth edged leaflets. The flowers are white and grow in clusters on thin stalks. In addition to the seeds produced by these flowering plants, strawberries spread by stolons as they get older. The fleshy, edible strawberry "fruit" is technically not a single fruit nor a berry. It is an accessory fruit; that is, the fleshy part is derived not from the ovaries, which yield the "seeds" (actually achenes), but from the peg at the bottom of the hypanthium that held the ovaries. (The hypanthium is the bowl-shaped part of a flower consisting of the bottoms of the sepals, petals, and stamens stuck together). So from a technical standpoint, the seeds are the actual fruits of the plant, and the flesh of the strawberry is modified receptacle tissue, which contains numerous partially embedded fruits (seeds). It is whitish-green as it develops and in most species turns red when ripe. Strawberries have been appreciated for centuries, with the Romans valuing the fruit for its reputed therapeutic powers; however, it was first cultivated in the thirteenth century (Herbst 2001). The garden strawberry (Fragaria x ananassa and related cultivars) is the most common variety of strawberry cultivated worldwide. It originated in Europe in the early eighteenth century, and represents the cross of Fragaria virginiana from eastern North America (the main native strawberry in the United States), which was noted for its fine flavor, and Fragaria chiloensis from Chile, noted for its large size. 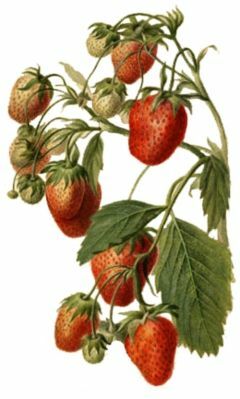 Cultivars of Fragaria x ananassa have replaced in commercial production the woodland strawberry (Fragaria vesca), which was cultivated in the early seventeenth century. Madam Tallien, a great figure of the French Revolution, who was nicknamed Our Lady of Thermidor, used to take baths full of strawberries to keep the full radiance of her skin. Fontenelle, centenarian writer and gourmet of the eighteenth century, considered his long life was due to the strawberries he used to eat. Fragaria comes from "fragans," meaning odorous, referring to the perfumed flesh of the fruit. The name strawberry is derived from Old English strēawberiġe, which is a compound of streaw, meaning "straw," and berige, meaning "berry." The reason for this is unclear. It may derive from the strawlike appearance of the runners, or from an obsolete denotation of straw, meaning "chaff," referring to the scattered appearance of the achenes. There is an alternative theory that the name derives from the Anglo-Saxon verb for "strew" (meaning to spread around), yielding streabergen. (Strea means "strew" and bergen means "berry" or "fruit.") Thus, the word could have evolved to streberie, straiberie, strauberie, straubery, strauberry, and finally, "strawberry," the word which we use today. The name might have come from the fact that the fruit and various runners appear "strewn" along the ground. Popular etymology has it that it comes from gardeners' practice of mulching strawberries with straw to protect the fruits from rot (a pseudoetymology that can be found in non-linguistic sources such as the Old Farmer's Almanac 2005). There are more than 20 different Fragaria species worldwide. Key to the classification of strawberry species is recognizing that they vary in the number of chromosomes. There are seven basic types of chromosomes that they all have in common. However, they exhibit different polyploidy. Some species are diploid, having two sets of the seven chromosomes (14 chromosomes total). Others are tetraploid (four sets, 28 chromosomes total), hexaploid (six sets, 42 chromosomes total), octoploid (eight sets, 56 chromosomes total), or decaploid (ten sets, 70 chromosomes total). As a rough rule (with exceptions), strawberry species with more chromosomes tend to be more robust and produce larger plants with larger berries (Darrow 1966). Numerous other species have been proposed. Some are now recognized as subspecies of one of the above species (see GRIN taxonomy database). The garden strawberry (Fragaria x ananassa) is the most common American variety and is probably the most hardy berry, able to withstand well shipping and storage (Herbst 2001). The European alpine strawberry (Fragaria vesca, commonly known as woodland strawberry, but also wild strawberry, alpine strawberry, and European strawberry) is considered to be more flavorful (Herbst 2001). These tiny, sweet, wild strawberries, known as fraises des bois ("strawberries of the wood") (Herbst 2001) are grown on a small scale commercially for the use of gourmets. This strawberry was widely cultivated in Europe before being largely replaced by the garden strawberry and varieties, which have much larger berries. 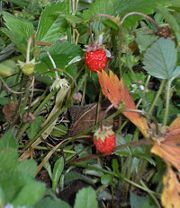 Unlike most commercial and garden cultivars of strawberries, woodland strawberries rarely form runners, and are usually propagated by seeds or division of the plants. Some cultivars of F. vesca have berries that are green, white, or yellow when fully ripe, in addition to the normal red. The mock strawberry and barren strawberry, which both bear resemblance to Fragaria, are closely related species in the genus Potentilla. The Strawberry tree is an unrelated species. FAO reports that USA was the top producer of strawberries worldwide in 2005, followed by Spain. Strawberries may be eaten fresh, made into jams and jellies, used in desserts, and used to flavor other foods, such as ice cream. Apart from its interest as a dessert fruit, the strawberry draws interest due to the peculiarities of its structure, its tendency towards variation, and the gardener's success in exploiting this tendency. Strawberries are rich in vitamin C and flavonoids, and provide sources of fiber, carbohydrates, potassium, phosphorus, magnesium, and calcium. F. vesca is sometimes used as an herbal medicine; an herbal tea made from the leaves, stems, and flowers is believed to aid in the treatment of diarrhea. Darrow, G. M. 1966. The Strawberry: History, Breeding and Physiology. New York. Holt, Rinehart and Winston. United States Department of Agriculture (USDA), Agricultural Research Service (ARS), National Genetic Resources Program. 2007. GRIN Taxonomy for Plants: Fragaria Germplasm Resources Information Network (GRIN). Retrieved December 18, 2007. This page was last modified on 2 April 2008, at 17:05.